Embrace Space! : Ottawa (and my) first ComicCon! Ottawa (and my) first ComicCon! About a month ago, I received a Facebook message from my mom. I was neck-deep in some work, but still foolish enough to be wandering around the internet. My mom, recently on Facebook and only occasionally teasing me via said medium, started chatting with me, telling me I really needed to be home for Mother's Day. At that moment, I was only staying online because she had started talking with me, and when I saw what I thought to be the first of many guilt trips about not being home, I was ready to get upset! Really!? You're telling me a month ahead of time, when I'm super busy with school, that I really should be home on Mother's Day? When, I had already planned on being home anyway? Arrrrgg..."Wait", she says, "ComicCon is coming to Ottawa, and I want to go, we all want to go, with you!" Whoa, did my mom just ask me to go to ComicCon? Yes, that is in fact what she did. Originally, we had wanted to make costumes. Even my dad, not normally one to get into this sort of thing, actually seemed excited about becoming a Klingon for it! My friends and I recently got into the argument that you wouldn't capitalize the word Klingon as you don't normally capitalize a species, for example homo sapiens sapiens, BUT, I would present the counter-point that it is not just a species, it is a culture, a group of...people. Anyway, I will capitalize it, and if you don't like it or disagree, please leave your comments. So, as I said, we wanted to do costumes this year, but with moving my stuff into storage, and moving home, we didn't get any time. It was okay though, I wore my Star Trek: The Original Series red Engineering t-shirt, and my grey, retro-looking, Star Wars: The Empire Strikes Back sweater, so I was happy. While Patrick Stewart was originally supposed to attend, something happened with his schedule and William Shatner came instead. It didn't really matter too much to my family, as we missed the chance to go on Saturday which was when Shatner was there. Instead, we went on Sunday, Mother's Day, and I'm actually glad we did. We showed up in time for the opening of the exhibition centre, 10am, and there were many parking spaces to be had! I expected to have to park far away and take a bus, but we had no trouble finding a spot. While the lineup to get inside was quite long, going around the back of the building, it moved fast, and it was a beautiful day. I got to see a lot of wonderfully dressed people there, pointing out the different characters, complimenting or critiquing a wardrobe piece or two and getting complimented myself on my knowledge or my sweater! Once making it inside, the place looked more like a toy store or comic book warehouse than a Convention. I have to admit that some things I look forward to in subsequent years are more panels, more booths, and less merchandise. I mean, I know people have to make money, and there were a few booths, but honestly, half the convention was merchandise, just tables upon tables of t-shirts and toys. Perhaps, all conventions are like this, I've only ever been to the ones I helped run, a la NERDSTOCK (ask me about this later, if you're interested), but it was a little aggravating, especially when I already owned most of the stuff for sale, haha. Anyway, my family and I made our way around and were generally excited by all that we saw. Not as many people were in costume, but again, it was Ottawa's first Comic Convention so that was to be expected. Still, the costumes I did see were generally well done. The first group of people we interacted with were actually local, from my hometown of Renfrew! They were showcasing Werewolf Fever, an award winning movie filmed in my town! I advise you to check it out as it was pretty good! It was a little campy, not too scary, but featured a werewolf tearing into waitresses on roller-blades at an old-fashioned diner. Also, there was a lot of horror culture represented at Comic Con. There were costume people, makeup people, props people, ghouls, skeletons, werewolves, you name it! It was unexpected, but a welcome addition to the Con. The next person we really interacted with was this woman, who had the best Klingon costume of all, although my mom keeps telling me how much better the one she's making my dad for next year will be. As I walked by her, I said, "Human females are sooo repulsive" quoting a line from Star Trek: Generations. Well, she thought I said Klingon women were repulsive and she pretended to threaten me with her knife. It was quite funny and below is my sister getting a picture with her. and a bunch of characters from Mortal Kombat! There were so many more, but these were the best. I saw quite a few Princess Leia's, in New Hope robes, or Return of the Jedi gold bikinis, as well as more than a couple of Wonder Women. I saw an article in the local paper asking if there are any other female nerdy characters to portray. Of course there are, I said, but I am curious, what are your thoughts? which was not only very cool, but you could pay money to sit in the car, and all of the money was going to the Michael J. Fox foundation for Parkinson's research, which was very cool. Also, we saw the Gran Torino from Starsky and Hutch, a show I have never actually seen, but still thought was a nice feature. There were so many other little things I could mention, but really, it was a collection of nerdy things, what else do you expect? So, after walking around, checking things out, and getting lunch, which by the way, wasn't as crazy expensive as I thought it would be, we decided to check out a panel with John de Lancie, better known as Q from Star Trek, or more recently as Discord from My Little Pony. He's a fascinating guy and I really enjoyed his talk. After updating us on what he's been up to, he took questions from the floor. Most had to do with Star Trek, which makes sense, but as he pointed out, it is quite interesting to consider he only appeared in 9 episodes of Star Trek and has done so much more. He didn't seem to mind, just thought it was interesting. One weird thing my mom pointed out was that he used to be on Days of Our Lives. Yeah, I know, right? But upon looking it up, his character, a Eugene Bradford, was an inventor who kept coming up with crazy contraptions and things to impress the love of his life. He also seemed to have psychic visions at times. At one point, he thought he could turn invisible and told everyone so. No one believed him, but then for almost a full season, he did. No one could see or hear him. He came back, and then invented a time machine and left, not coming back to the show. I did not realize that soap operas could have such science fiction or fantasy elements in them, but apparently they do. Anyway, his talk was quite informative and pretty funny. He seemed like a nice guy and every now and then, the booming voice and sneer of Q would come back in some of his comments. 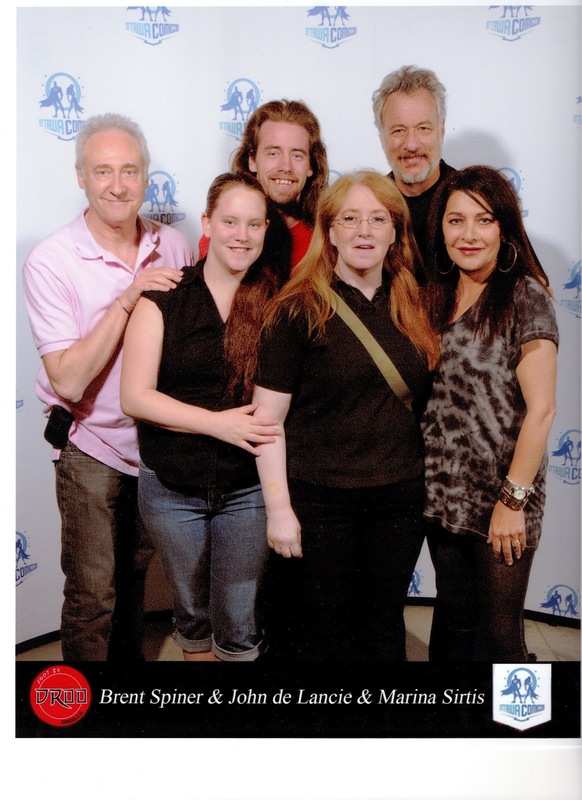 After that, I waited in line to get my picture taken with John de Lancie, Brent Spiner (Data from Star Trek) and Marina Sirtis (Deanna Troi from Star Trek). I was very excited, and especially so because they allowed me to bring my mom and my sister into the photo. My dad was tired and had gone back to the car to lie down. I was getting more and more excited as the line moved forward. I mean, I know they're just people, but they're people I grew up with, and as daft as it is, I feel like they are a part of my life. Anyway, the time had come, we were all rushed because there were so many people waiting for photos. We rushed in, Brent invited us to step into his office, haha. The photo was taken, as seen below, and I turned to them saying it was very nice meeting them and telling John de Lancie that I just saw and liked his panel. Marina Sirtis said, "Mine's better!" and I shrugged and said, "Well...", she gave me a mocking look of shock as we all laughed and rushed out. Like most moments in life, it was highly sought after, too short, but very amazing. The next thing I did was get an autograph from Adam Baldwin, better known as Animal Mother from Full Metal Jacket, Jayne from Firefly/Serenity, and John Casey from Chuck. I just wanted to meet him, really, as I have liked him in everything I've seen him in and thought he might be the easiest to actually talk to. The line up moved slowly, and I hoped it was because I was right, and that he was super friendly. As I waited for my turn, I tried to think of what I would say. I wanted to say something original, or at least refreshing, but I didn't want to shock him by being too original or weird. I also thought about how a friend of mine and I really bonded over watching the show Chuck together. We started the show a little late, but both flew through it, catching up with the weekly release of new episodes. You've possibly seen my review of the show, seen here: Chuck, but in either case, the show grew on us and it became part of our routine to watch it together and talk about it when we could. It was the first time in quite some time that I had watched a show with someone else, and enjoyed it as much. As I waited in line, memories of the show and our friendship floating around in my brain like a clip show, I realized what I wanted to say. The time had come. I paid my money, and choose the photo I wished him to sign. Wearing a hoodie and a baseball cap, the guy looked more like a construction worker than a big time actor, but I guess that was to be expected, given his seeming character as I had known it; friendly and down to earth. I shook his hand and introduced myself. He said it was nice to meet me and I asked if the autograph could be made out to me and my friend. He instantly grabbed a second photo and began signing both! It was so nice! I mean, sure, it's not a big effort, and I had paid quite a bit of money for his signature (less than some other conventions and actors I had heard of, but still, more money than handwriting usually warrants), but it was still really nice of him to sign them both, one for me, and one for my friend. I said as such and he said he was happy to help. I told him how my friend and I bonded over watching Firefly and Chuck and how this was a parting gift of sorts as we were moving apart. To fill the time as he signed them, adding lines like "Shiny! Let's be bad guys! ", I told him how I thought his growth as a character in Chuck was the best part of the show, that, or how he could get by on just grunting the whole time, at which point he grunted and we both laughed. I thanked him very much and said it was nice meeting him, and as he handed me my photos, he smiled and said meeting me was a pleasure. I looked at him, and at my photos and said, "I'll be in my bunk", and walked away as he burst out laughing. For those of who who don't get the reference, watch the first 35 seconds here. It was pretty amazing! I ended the day catching the last 20 minutes of the Brent Spiner panel in which he did impressions of Marina Sirtis, and Patrick Stewart. He seemed a little into himself, but honestly, it was entertaining, and he had a way with the crowd. My sister and I got my mom some Mother's Day gifts, in the form of autographs from John de Lancie and Lou Ferrigno, and after that, we made our way home. It was the best Mother's Day I can remember, and it was a very great experience at Ottawa's first ComicCon. There are some things they would need to work on for next year, more panels, better organization and promptness with the photos, but otherwise, the fan service was well done, the place was highly organized, and the experience was wonderfully unforgettable.